Time to get all traditional with one of my favourite Nigerian meals - iyan and egusi soup. It's also a staple dish from my home town (Ilesa). Iyan is the Yoruba name for pounded yam. The yam is boiled and then pounded to thick, smooth, dough-like consistency. Unless you have a giant mortar and pestle lying around, along with incredible upper body strength, then a food processor will do. You can find pounded yam flour in most African food stores, but why use that when you can make it fresh yourself? It takes a bit longer, but tastes a whole lot better. Egusi is a thick soup made with leafy green veg, ground egusi (melon) seeds, tomato, pepper and onions. My vegan version is probably also a lazy version. No need to spend forever in the kitchen to make this tasty dish! To make the iyan, boil the yam in some salted water until soft. Place in a food processor and blend with a little water to form a thick, smooth consistency. Scoop into a bowl, ready to be served with the egusi soup. To make the egusi soup, start by blending the peppers, tomatoes and onion with a little water. Heat some palm oil in a large pot and add the blended mixture. Season with salt. Add the vegetable stock and bring to a boil. Add the chopped spinach next and sprinkle the ground egusi over the top of the spinach. Cover and simmer on medium heat for 20 minutes. The egusi should cake a little. Give it a good mix and cook uncovered for a further 10 minutes. At this point you can add in some extra chopped vegetables (as a meat alternative). Serve hot with some pounded yam. A winning combination. how do you make the vegetable stock? There are two ways to make vegetable stock: the lazy way and the indulgent way. Lazy way: dissolve some vegetable stock cubes into some boiling hot water. Indulgent way: throw a variety of vegetables such as carrots, peppers, onions, spring onions and ginger into a large pot of water, add herbs such as bay leaves and thyme, and simmer for about an hour. Then pass through a sieve (retaining the liquid and discarding/using the cooked veg for something else). I bought pounded yam flour and have struggled to follow the instructions. Thank you for making it so clear. The illustration on the pack showed neatly shaped little white cakes, but there was no way I could make those from this thickish gloop that I had made. Your intructions and photo make it so clear; it's just served like mashed potatoes or skirlie on the plate, and it's lightly salted too. The egusi soup sounds good; I might try that as well. Hi Mary, thanks for your comment. Yes, there's no need for anything fancy. Served up like mash and still tastes great :) Enjoy cooking! I tried this recipe last night with ground egusi seeds I bought many months ago - the soup tasted rather bitter, and I'm wondering whether I'm just not accustomed to this taste or if perhaps egusi seeds have a shelf life and then go bitter? Any input would be appreciated :) Thanks! Thanks for leaving a comment. 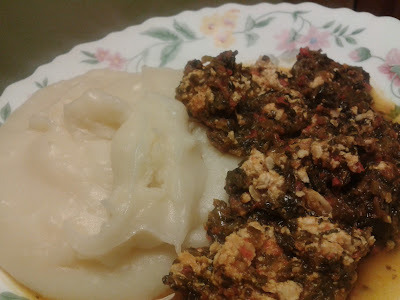 Egusi soup shouldn't have a bitter taste. It is possible that the lack of freshness could have caused the bitterness. Freshly ground egusi will always give a superior taste. The palm oil could also be an issue - be sure that it is unrefined and from a reputable source. Hope that helps! I make this egusi stew all the time but always have it with plantain or gari. I agree the fresh yam tastes much better than the yam flour but never got the hang of making the pounded yam... Yet I never thought to try making it in the food processor either, until now. Thanks! No problem :) Thanks for your comment! Hello! How many servings does this make? Hi, this can serve up to 2 people. I made this for my office - it was an instant hit!